When you make the decision to get married, life becomes chaotic. It starts with the wedding plans and the piling up of decorations. Then it’s the downpour of gifts from the bridal shower, reception, and all the months in between. And for all those months in between, a monster called decorations keeps growing, and there’s no place to put them. They belong at a wedding venue, not a house. Even the gifts that can be put away still remain in their own pile for weeks. The problem for most couples is trying to find the time during their busy weeks to open all them and put it all away. For others, it’s not having enough space. They are often still saving for a house and are living in a tiny apartment. They asked for items they knew they would need eventually in life. But just not now. Between wedding gifts and decorations, your small space feels even smaller than it really is and gets lost in the clutter. 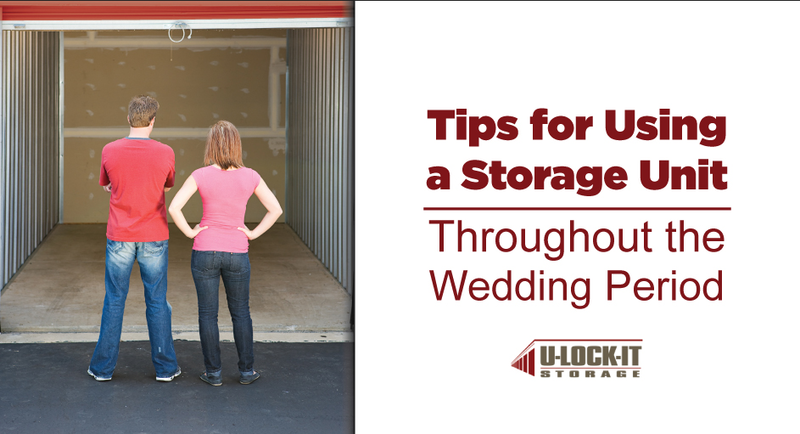 Rather than allow your home to be overtaken, get a storage unit to make your life easier. Once the wedding is over and you realize you need something, you may be tempted to go out and buy it rather than check your massive pile of gifts. As you receive gifts, add them to a list of with either a picture or detailed description and the name of who gave it to you. This will keep you from buying something you already have as well as make sending out thank you notes easier to write and more personal. At this stage in life, you probably don’t have a ton of stuff to keep in a storage unit forever. You’re going to slowly start taking stuff out as you have time and space. To avoid having to rummage through the entire unit looking for one item, keep all your boxes labeled. If you’re both combining what you own, odds are that you’ll have duplicate items. Choose which you want and assign the other to be moved into a yard sale section of your unit. As you continue to dig through your possessions to move in together, you’ll also likely run into stuff you didn’t realize you even still had. Rather than hold onto it forever, decide what things you really need or couldn’t bear to see go and get rid of everything else. You’ll gain extra space as well as some little extra cash for your new life. Contact U-Lock-It Storage today for assistance deciding what size unit will best suit your needs and budget. Also ask about what items aren’t safe to go into storage, so none of your new gifts or decorations are ruined.